Internet is the doorway through which you enter into the world of interesting websites. Nowadays, every company has its personal website. Drupal is an open source platform written in PHP which helps in managing the contents of your website. You can use this platform to give your business an amazing outlook. Having a website is not the ultimate step. You need to ensure that an adequate traffic is generated through it. If you are searching for a reliable platform to develop your website, you can easily rely on Drupal. Contact our experts at UAE Technician to avail services for Drupal web development. It is an open source software which means that it is free to use. 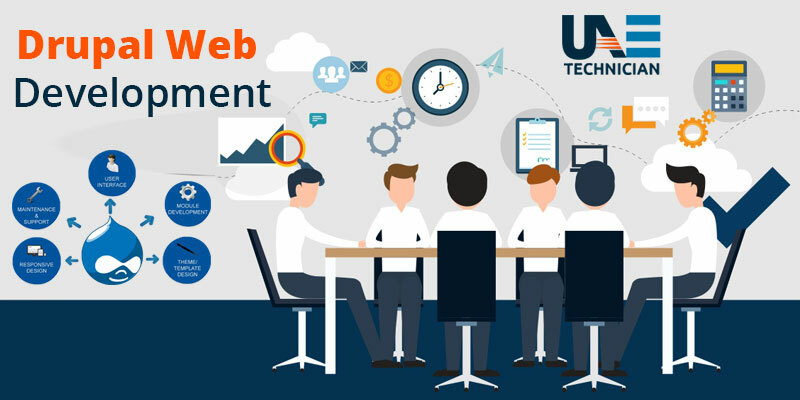 Thereby, it helps in the reduction of cost which is necessary for web development. Drupal allows customization as per the requirements of your client’s. You can easily integrate with applications like SAP, phpBB, etc. It provides flexibility to the developers and is equally SEO-friendly. If you want a unique website with awesome features, Drupal is your ultimate choice. In short, you will get a dynamic website by availing services for Drupal Web Development in Dubai. Attract your audience by calling at our helpline number: 042053349 . Are you getting a busy tone while dialing our number? Do not waste your time in dropping an email. Our team cares about the reputation of your business. In addition to that, we accept feedback from our customers which helps us to know about your interests. Have faith in us, we won’t let you down. We also provide WordPress web development service in Dubai.